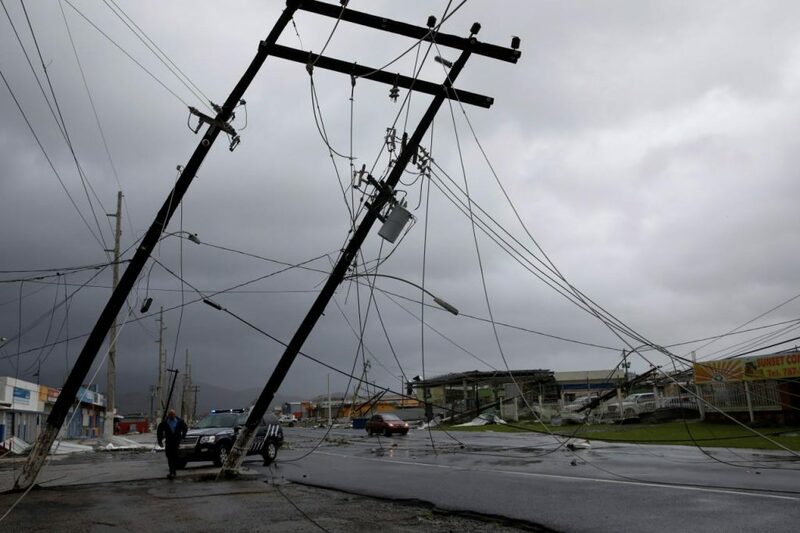 In September 2017, after two Atlantic hurricanes made landfall, Puerto Rico’s electricity grid collapsed. The lack of electrical power affected an estimated 3.4 million people. There was no electric lighting, mobile phone charging, air conditioning, or refrigeration—a shock for domestic consumers as well as for national health, communication, and food storage systems. Amid the debate—and with no alternative solution to the island’s short-term power needs—international governments and aid agencies, church groups, and businesses began to ship thousands of solar-powered lamps into Puerto Rico. The British government announced that its response to Hurricane Irma in Puerto Rico and the British Virgin Islands involved the distribution of 60 metric tons of aid, including nearly 3,000 shelter kits (like those described by Tom Scott Smith in Limn #9) and 4,990 solar lamps, which they estimated would provide light and power for more than 20,000 people. In New Mexico, one the largest grassroots environmental organizations in the United States, the Sierra Club, coordinated a shipment of 1,000 solar lamps. And in Chicago an emergency solar lighting company, LuminAid, matched pledges from members of the public with pledges from corporations to secure 25,000 additional solar lights and phone chargers for people across the Caribbean. How did the solar lamp become a self-evident solution to the ethical and practical problems that emerge in a humanitarian emergency like that facing Puerto Rico? During the last four decades, the catalog of photovoltaic appliances designed to do good in places with no or limited access to electricity has expanded exponentially. Alongside solar-powered water pumps, one now can find solar-powered desalination systems and water-purification kits; solar-powered medical packs, diagnostic devices, and vaccine refrigerators; solar-powered chargers, mobile phones, and routers. But among this burgeoning solar array, the simple solar lamp has become a ‘minimal’ technology for living (Redfield 2012). For people in diverse contexts—from concerned citizens witnessing the emergency in Puerto Rico from afar to professional aid workers in humanitarian institutions—the solar lamp has come to serve as a benchmark of whether or not people have access to the most basic level of clean, efficient energy deemed necessary for human life. How is this so? How did ideas about what constitutes a basic level of access to electrical power become equated with the solar lamp? 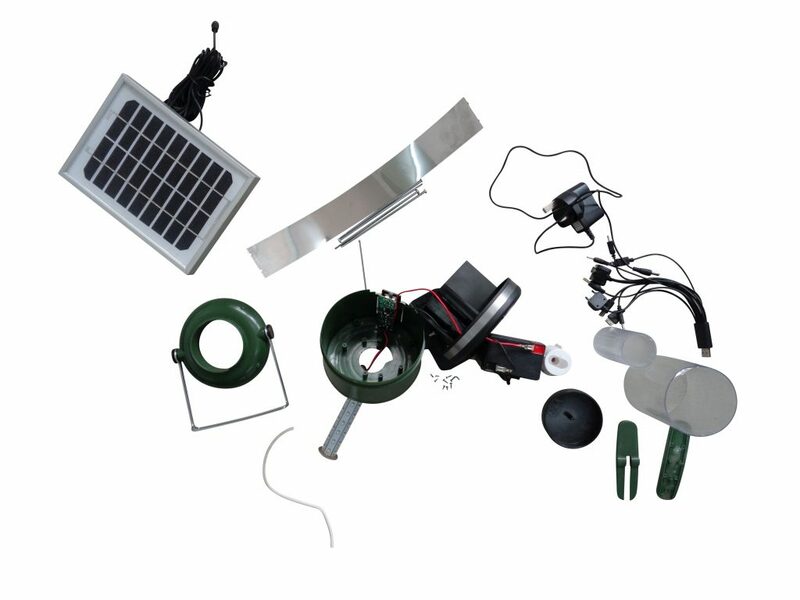 The solar lamp is a generic term for a small portable lighting system powered by a photovoltaic module of zero to 10 watts. When placed in sunlight, photons excite electrons in the module into higher states of energy, allowing them to act as charge carriers for electric current. The current is sufficient to charge an internal battery, allowing a bulb or light-emitting diode (LED) to be switched on in the dark. But open up these solar lamps, literally and figuratively, and there are other critical components at work. These include ideas about the ecological and humanitarian promise of solar technology, ideas about the capacity of a solar light to empower and emancipate, and ideas about electric lighting as a basic human need. Indeed, the brief history of the solar-powered lamp is a story about its evolving imagination as much as its technical development. For the past five years, I have been following attempts to build markets for small, off-grid, solar-powered lighting devices across semi-electrified parts of rural India. 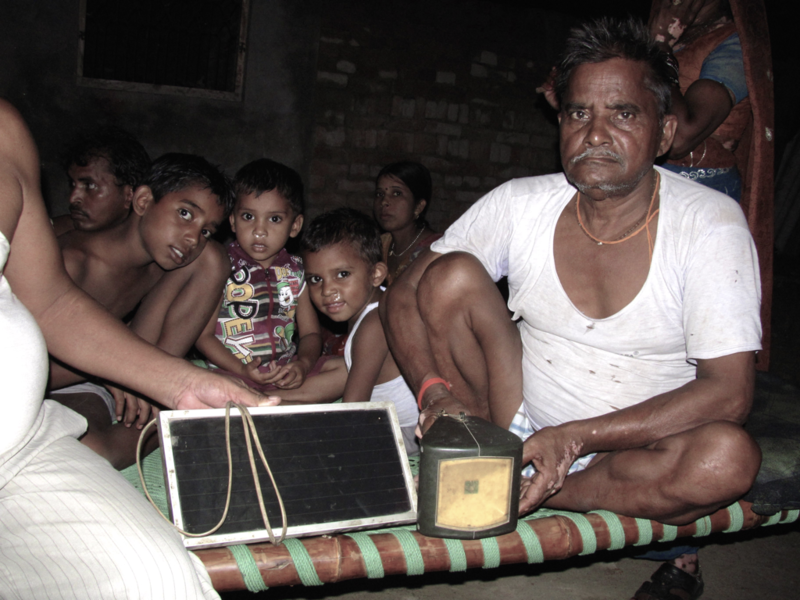 In rural India, the solar lamp has a distinct “energo-politics” (Boyer 2014) married to market expansion and projects of governance, social, or moral reform. Here the solar lamp is an exemplary little development device that captures both the diminishing scale of development visions and their continued grandiosity of ambition. It expresses a concern for human wellbeing by targeting a minimal level of need for artificial illumination; it minimizes the role of state institutions in meeting this need through projects of rural electrification; and it makes a claim to universal utility. So what kinds of disjuncture, slippages, and continuities emerge as the same device is deployed in humanitarian emergencies, from earthquake relief in Nepal to refugee camps in Burkina Faso, Kenya, or post-hurricane Puerto Rico? d.light’s solar lamp was lauded as a vanguard technology by social investment funds and international development donors, who saw it as the cutting edge of “bottom of the pyramid” design and social innovation (Cross 2013). During the next decade, d.light became one of the world’s largest off-grid solar companies, with its products available in petrol stations between Mombassa and Kampala thanks to a partnership with French petrochemical giant Total. The company’s success inspired dozens of competitors, and today manufacturers of small-scale solar lighting devices compete for a share of niche off-grid energy markets across sub-Saharan Africa and South Asia. To the public, such concerns may appear to have little traction, perhaps because they fail to grasp the register in which small, solar-powered lighting devices are marketed or their claims to a minimal kind of intervention in contexts of failure or crisis. But the off-grid solar industry—solar manufacturers, distributors, and a trade body, the Global Off-Grid Lighting Association—have responded to such criticisms by managing their legitimacy, shifting the debate away from whether solar-powered light is a public good or whether people should be buying solar-powered lamps to the quality of the products themselves. During the past decade, the growth of the off-grid solar industry has been accompanied by new solar lamp product standards—themselves a market infrastructure (Bowker and Star 2000). These product standards have created new distinctions between models and manufacturers. 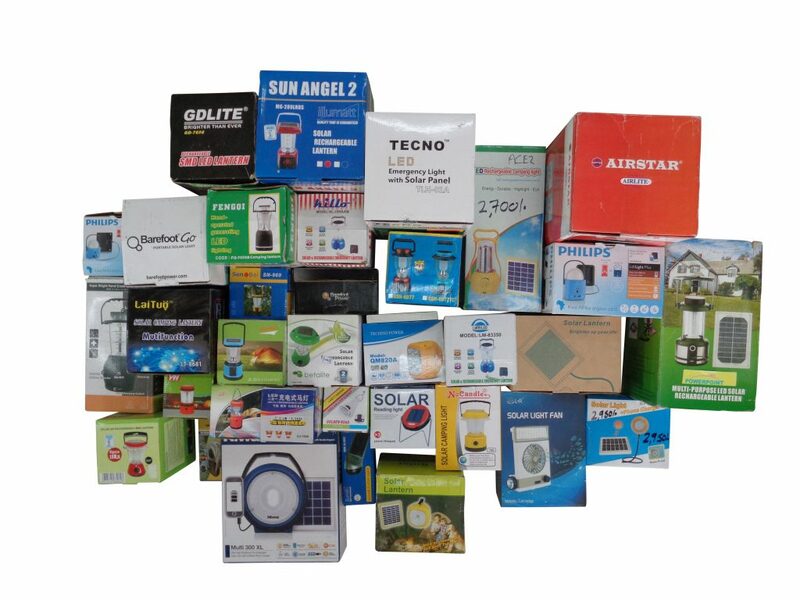 They also have refocused the question of whether a low-cost solar lamp is an appropriate solution to energy poverty, infrastructural failure, and climate change to the question of whether individual solar lamp products meet minimum standards. The development of solar lamp product standards has been led by the World Bank and the International Finance Corporation as part of a joint Lighting Global program aimed at improving access to clean, affordable lighting. The Lighting Global program has introduced minimum quality standards for luminosity or lighting output, durability, battery performance, and consumer warranties (though not reparability or sustainable design) against which solar lamps could be evaluated, as well as network of testing facilities in the United States, Germany, India, Kenya, and China. These standards have been adopted by a number of governments and institutions, from the Kenya Bureau of Standards to Nepal’s Alternative Energy Promotion Centre, and in 2015 they became the basis for the International Electrotechnical Commission’s proposed recommendations for the procurement and purchase of portable solar photovoltaic lamps, which are used by U.N. agencies, governments, and international development organizations. By 2017, the small solar lamp was a mainstream consumer durable across sub-Saharan Africa and South Asia with annual sales of more than 22 million units. The majority of these solar lamps, however, do not meet the new international quality assurance standards. Recent trade figures estimate that only 29 percent of small solar lights sold globally have been certified under Lighting Global’s Quality Assurance Program (World Bank/Dalberg 2018). Such figures point to considerable variation in the quality—luminosity, efficiency, and durability—as well as in the experience of electric lighting worldwide. They also suggest the market challenges facing U.S. and European solar lamp manufacturers such as d.light. This definition established the solar lamp as a global benchmark of whether basic needs for electricity are being met. It also has helped to make a humanitarian imperative of the distribution of solar-powered lamps to people without electricity in contexts of emergency and crisis. Today, solar lamps are a ubiquitous part of the international emergency response to natural disasters, forced displacement, and disease epidemics. They can be found in the treatment kits distributed to medical practitioners in West African Ebola virus clinics, in the emergency packs distributed to people displaced by the Haitian and Nepalese earthquakes, and in the temporary settlements erected by the UNHCR to house people fleeing across international borders from violence in Mali and Syria. These humanitarian emergencies are important moments for the off-grid solar industry. In them, the solar lamp is resolved as a humanitarian gift that can be given to end users rather than as a commodity to be sold to them. In 2015, for example, the U.S. humanitarian agency Mercy Corps added a Lighting Global-certified solar lamp to a “non-food relief kit” it distributed to families affected by the earthquakes in Nepal. For Mercy Corps’ staff, the appropriate emergency response to the crisis was the free distribution of energy technologies, not the provision of low-cost solar devices through the extension of micro-credit (see Jonathan Morduch in Limn #9). In the midst of humanitarian emergency, however, markets for goods are not erased, they are redefined around institutions and organizations, aid agencies, and charities. The gift of solar light lays the groundwork for future consumer markets. Humanitarianism has become a core part of the off-grid solar business, with humanitarian emergencies creating important opportunities for brand-name recognition, partnerships with aid agencies and charities, and investment. As competition in the off-grid solar industry has increased, humanitarian agencies like Mercy Corps have become important institutional consumers for solar lighting companies that manufacture products to Lighting Global’s quality assurance standards. As these companies find themselves undercut in consumer markets by lower-cost competitors, their partnerships with international organizations, charities, and humanitarian agencies become more important. The employees of these companies work hard to win tenders and bulk purchase orders for solar products. When they respond to global humanitarian crises—moved by reports of suffering to get devices to those in need—they do so strategically. As they work through the numbers, they are also considering the implications for their current inventory, future sales, and for their reputation. Six days after the 2010 earthquake in Haiti, for example, the World Bank, the Inter-American Development Bank, and the Global Environment Facility committed $3 million to an emergency program to provide “autonomous energy and light” using solar power. The World Bank took responsibility for procuring solar lamps and transporting them to Haiti for use in camps for displaced people, where it was hoped they would increase security and provide lighting that could address urgent post-disaster needs in Port au Prince and other affected areas.⁠ d.light won an early procurement contract and in the following year the World Bank purchased 40,000 of its solar lights as part of the relief effort. Converting such humanitarian partnerships into a sustainable business owes much, perhaps, to a company’s marketing vision and initiative, as well as its prior positioning and connections. Five years later, d.light’s products were such an established part of post-disaster humanitarian emergency responses that, in Nepal, they were Mercy Corps’ preferred supplier. The sale of solar lamps to humanitarians rather than directly to end users has presented solar-manufacturing companies with a familiar business challenge. Without the prospect of agencies, charities, and international organizations stockpiling supplies of solar lamps—and without a reliable stream of crises—these markets are unpredictable and volatile, demanding new knowledge and expertise. 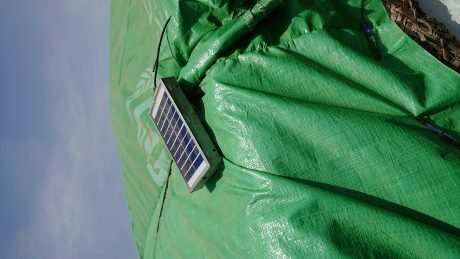 In sub-Saharan Africa, one response has been to reimagine refugees and refugee camps as potential future markets for low-cost solar-powered devices. In an emerging field of “humanitarian energy,” for example, researchers currently are seeking to establish the optimal pricing and aesthetic preferences of forcibly displaced communities in sub-Saharan Africa, with a view to expanding market opportunities for off-grid energy companies (e.g. Corbyn and Vianello 2018). Such efforts create important continuities between the arenas in which these devices are deployed as little development devices and those arenas in which they are deployed as humanitarian goods. The role of solar-powered lighting in humanitarian emergencies has become an important part of the global solar industry’s self-image, inseparable from its projections of future growth. For example, at an international trade fair hosted by the Global Off Grid Lighting Association in 2015 in Dubai, plenary speakers were presented with a customary token of thanks. But rather than a bouquet of flowers or a wooden plaque each speaker was presented with “a gift of solar light” given not to them but on their behalf to displaced Syrians living in refugee camps on the edge of Europe. “We hope you agree,” the trade association’s chief executive told the audience, “that the best way to thank our speakers is by giving the gift of solar light to people who can’t be part of the market at the moment but will hopefully become customers in the future.” For the off-grid solar industry, it now appeared, access to the market and access to light were equivalent human needs. The analyses and projections produced by economists, accountants, and marketing researchers for the off-grid solar industry have played an important role in shaping this market horizon. A recent report on market trends in the off-grid solar industry produced for the World Bank by Dalberg Advisors, a New York based development consultancy describes the chance that individual owners or users of solar lamps may become future customers as their “lifetime value potential.” Aggregated sales data from off-grid solar companies and the industry’s trade association allows analysts to model this potential by modeling individual consumer journeys from an entry-level, portable solar device like the solar lamp to larger, more expensive devices like a solar home system. As the report puts it, “sophisticated, branded players have created an internal energy product ladder that not only caters to customers’ differing willingness to pay, but also induces customers to migrate from basic to more feature-rich products over time” (World Bank/Dalberg 2018: 4). The possibility that the recipients of an emergency solar-lighting kit might become future consumers is creating powerful incentives for the off-grid solar industry, particularly in places like Puerto Rico where the future of a public energy utility hangs in the balance. These two moments in the history of the solar lamp—the bottom of the pyramid light and the emergency light—suggest slippages between what we have described as development devices and humanitarian goods. 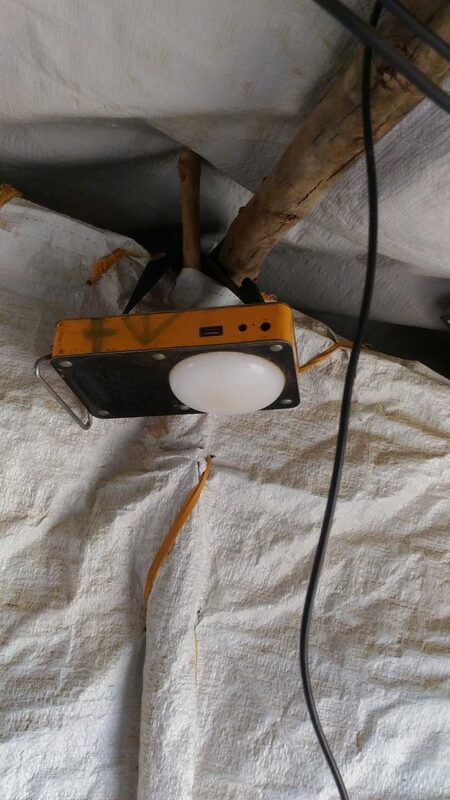 The same solar-powered lamp can be deployed in a semi-electrified Indian village or a temporary settlement for people displaced by natural disaster. In one context, it is a technology designed to be sold direct to the end user; in another, it is designed to be sold to institutions, organizations, and charities. These contexts are more closely related than we might apprehend. As a little development device and a humanitarian good, the solar lamp meets a minimum basic need while opening pathways to new electric desires and aspirations. In both guises, the solar lamp is a stop gap that folds the promise of renewable energy into commitments to intellectual property and market growth, shaped by international product standards. There are many solar-powered lamps. 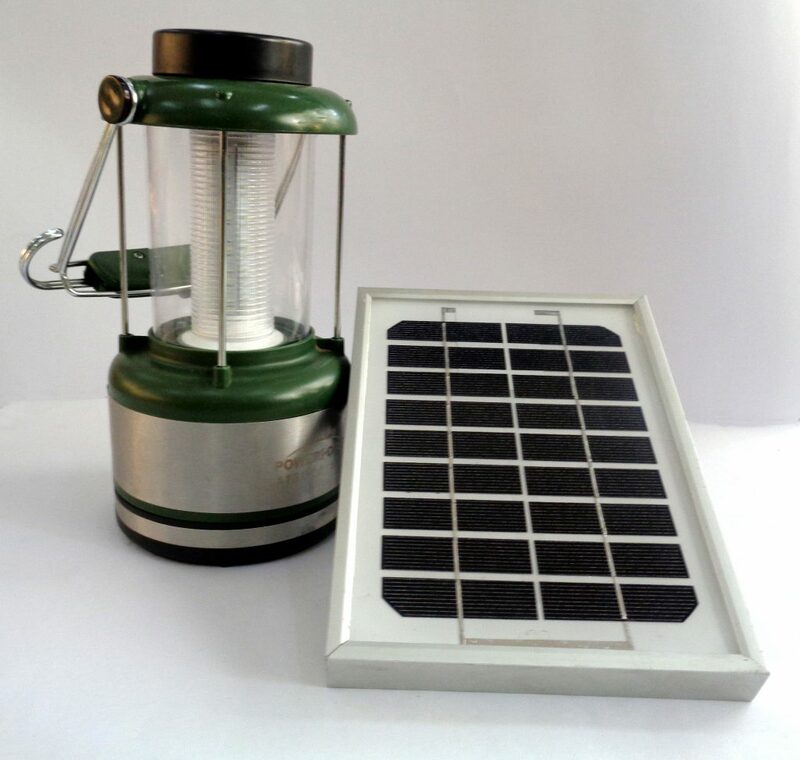 But within the off-grid solar industry the only solar lamps deemed capable of operating as either little development devices or as humanitarian goods are those products that have been certified in accordance with what are now international standards. It is not just their material parts that this process legitimates but their ethical credentials: their claims to care, to transform lives, and to meet basic human need. From the point of view of the off-grid solar industry, only certified solar lamps are inscribed with the qualities that allow them to do good. The rest are bare commodities. This distinction played out in the wake of Hurricane Maria as the first shipments of solar powered lamps to Puerto Rico were distributed. A month after the hurricanes hit Puerto Rico, President Donald Trump made a four-day visit. He toured the main island and visited sites of reconstruction. In the capital city, San Juan, the president stopped at the Calvary Chapel, an evangelical church with strong ties to the mainland. 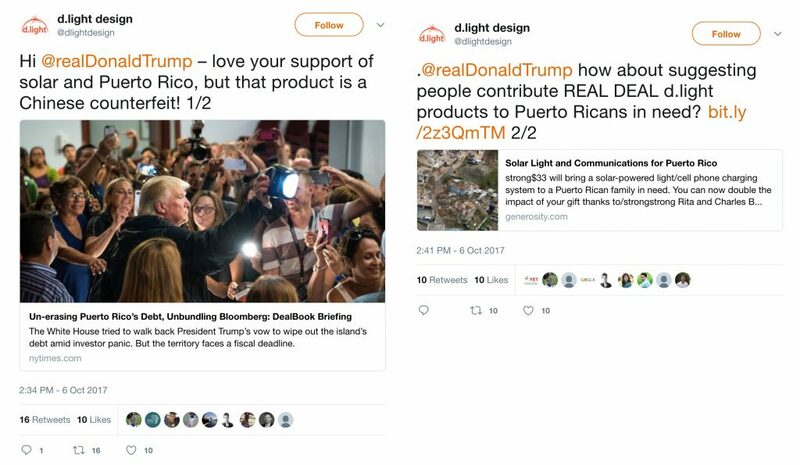 Journalists photographed Trump distributing aid supplies, including solar-powered lamps. These were some of the 2,200 lamps that had been donated by a U.S. based nonprofit called Watts of Love. 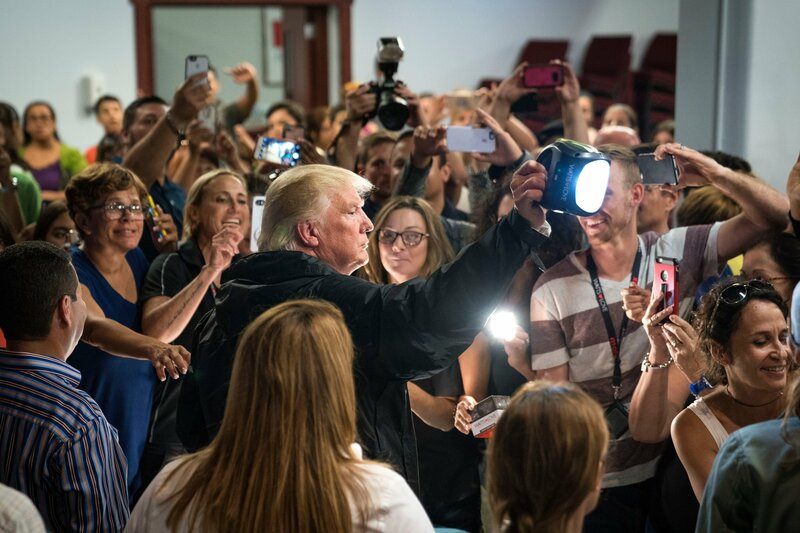 “Flashlights, you don’t need them anymore,” the president reportedly said as he handed the solar lamps to people in the crowd, reiterating the dominant message of his visit, that Puerto Rico was making a miraculous recovery and that island would soon be back on the grid. But the Watts of Love solar lamps were not the same as the those distributed by the U.K. government or the Light is Hope campaign. These lamps had not been certified by the Lighting Global standards authority. They were what the off-grid solar industry calls fakes. Bowker, Geoffrey C. and Susan Leigh Star. 2000. Sorting Things Out: Classification and its Consequences. Cambridge: MIT Press. Boyer, Dominic. 2014. “Energopower: An Introduction.” Anthropological Quarterly, 87(2): 309-333. Corbyn, Drew and Mattia Vianello. 2018. “Prices, Products, and Priorities: Meeting Refugees’ Energy Needs in Burkina Faso and Kenya.” The Royal Institute for International Affairs’ Moving Energy Initiative. Available at: link. Cross, Jamie. 2013. 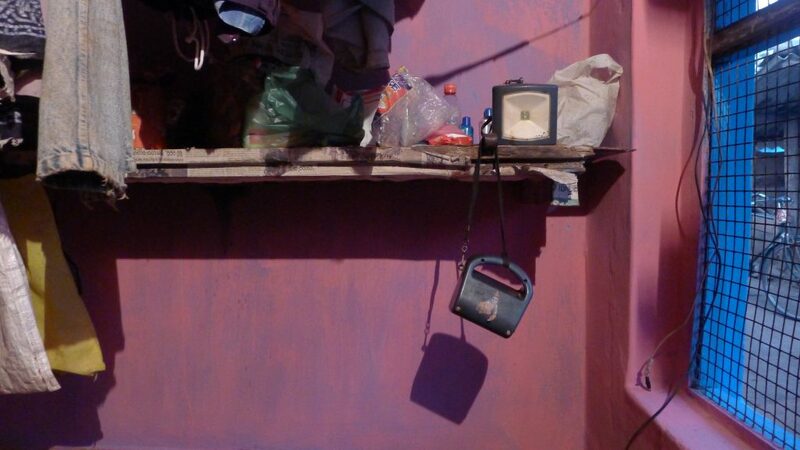 “The 100th object: Solar lighting technology and humanitarian goods.” Journal of Material Culture, 18(4), pp.367-387. Redfield, P. 2012. Bioexpectations : Life Technologies as Humanitarian Goods. Public Culture 24, 157–184. World Bank/Dalberg. 2018. “The 2018 Off-Grid Solar Market Trends Report.” International Finance Corporation. Available at: link. U.N. Sustainable Energy for All. 2013. “Global Tracking Framework.” Available at: link.